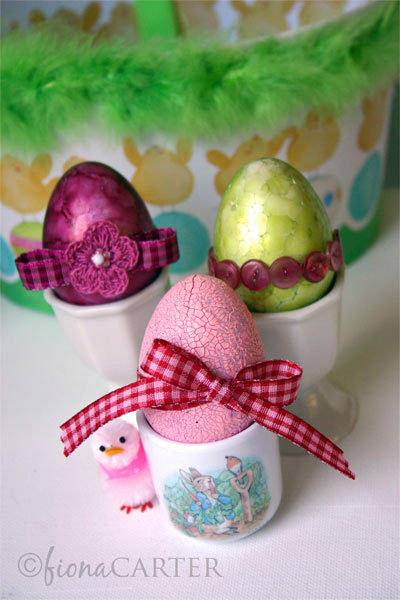 Easter is just over three weeks away, so its time to start some Easter craft. 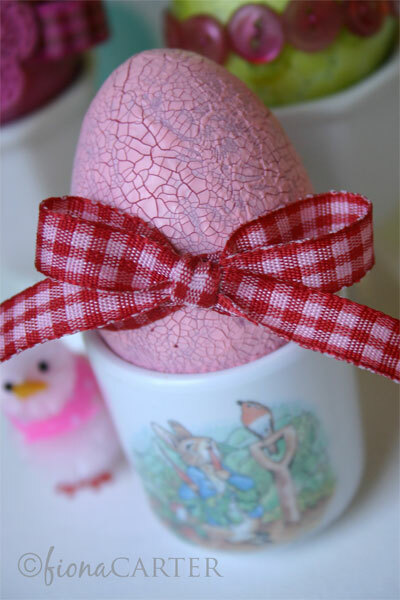 Though I'd share some of our Easter projects here on the blog over the next few weeks. 1. Collect supplies. 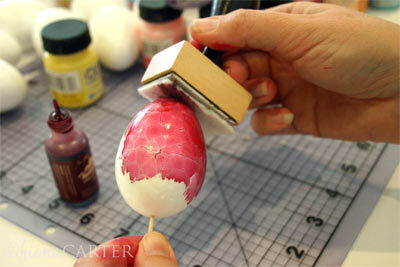 Polystyrene (white foam) egg shapes, Ranger Distress Crackle Paints and Tim Holtz Alcohol Inks, acrylic paint and toothpicks. 2. 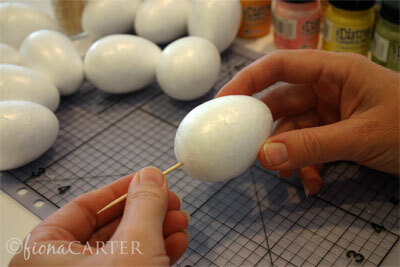 To make handling the eggs easier while painting, stick a toothpick in the base of the foam egg. 1. 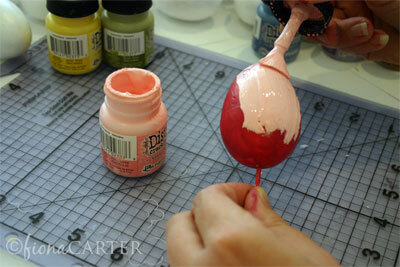 Paint the egg with acrylic paint. Let dry. 2. 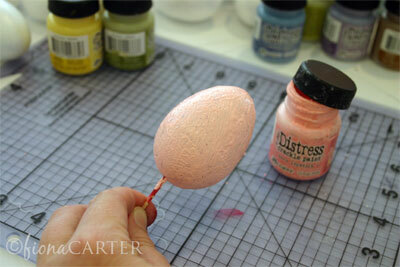 Once thoroughly dry, paint the egg with Ranger Distress Crackle Paint. 3. Once completely covered leave to dry, again. 4. It's dry and the paint has crackled. 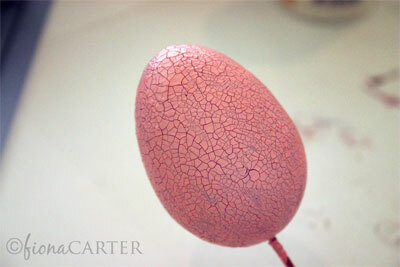 On this egg I've used a fuchsia acrylic paint under a lighter pink crackle paint. 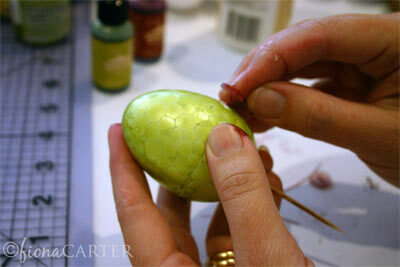 At this point you could use a clear sealer to add a little gloss to the egg if you wanted. 5. Now decorate. 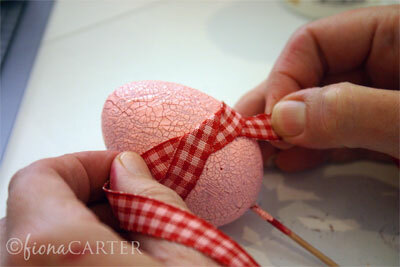 Tie a ribbon around the egg and tie a double knot. 6. Tie a bow. If you need to secure your bow, use pins to hold the ribbon in position. Try to hide the pins in layers under the bow. Tip: I painted an egg with the distress paint (with no acrylic paint undercoat) and as the crackle paint dried, it peeled off the egg. 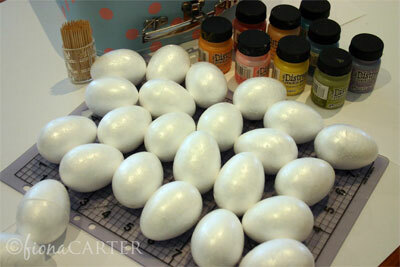 It seems necessary to paint the foam eggs with acrylic paint or gesso first before painting with the distress paint. 1. 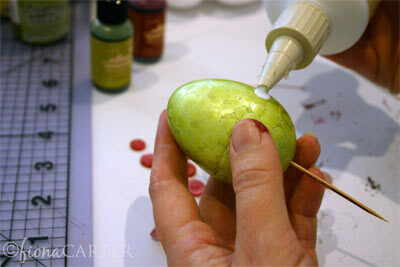 Dab the Tim Holtz Alcohol Ink onto the surface of the egg. Leave to dry. 2. 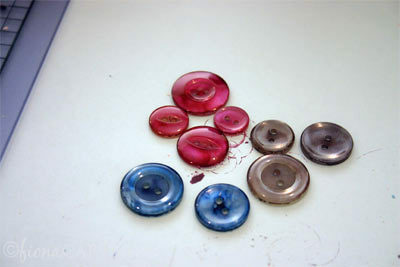 While you have your inks out, you can colour some old clear buttons which you can use to decorate the eggs later. 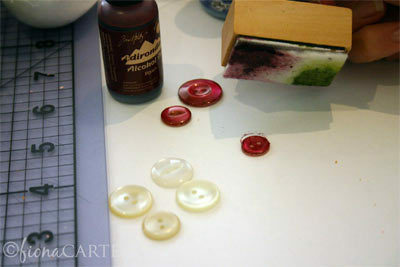 Dab the ink onto the top of the buttons and leave them to dry. 3. 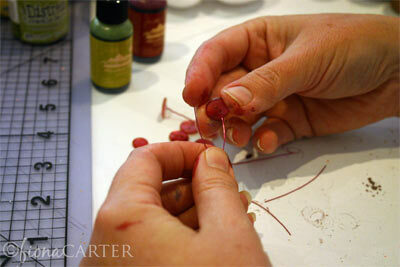 Cut short lengths of fine gauge wire (I used some scrapbooking wire that I'd had in my stash for ages). 4. Thread the wire through the holes in the button. 5. 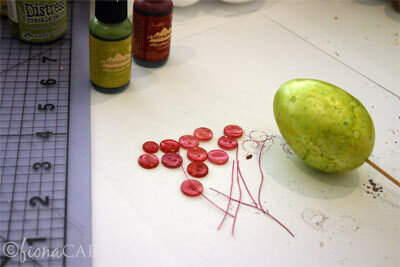 Apply a small dob of glue to the egg where you will place the button. 6. 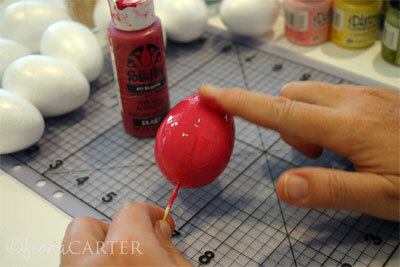 Pierce the egg with the wire and push the button in place. 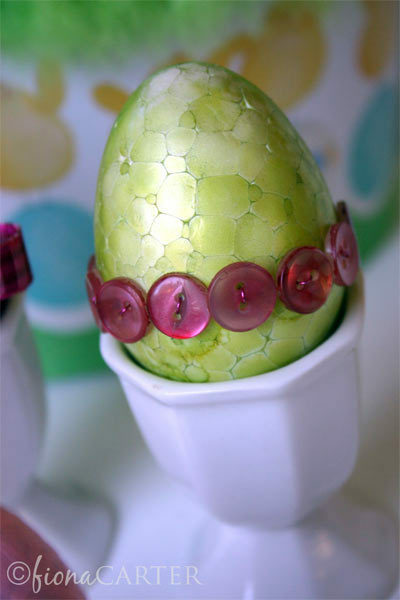 Continue around the egg until a row of buttons is formed. This one is finished too. 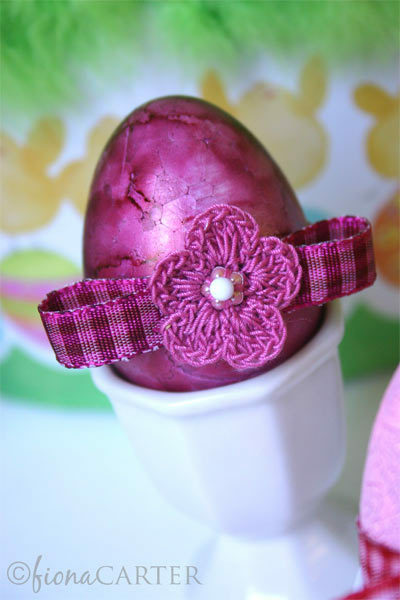 Another way to decorate an egg is to wrap with ribbon, form a loop (bow) and top with a flower held in place with a pin. This little crocheted flower is a new one from Maya Road. The gingham ribbons used on these eggs are new in store at Ribbon Galore. 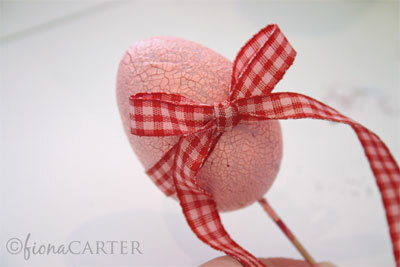 I'd love to see any of your egg-y creations that you make for Easter, either following my steps above or your own. Leave a comment to this post with a link to your creation. I'll draw out a name to win an Easter RAK next week some time. Thanks for visiting, hope you're having a great week.